recipients name & address if card is being sent direct. 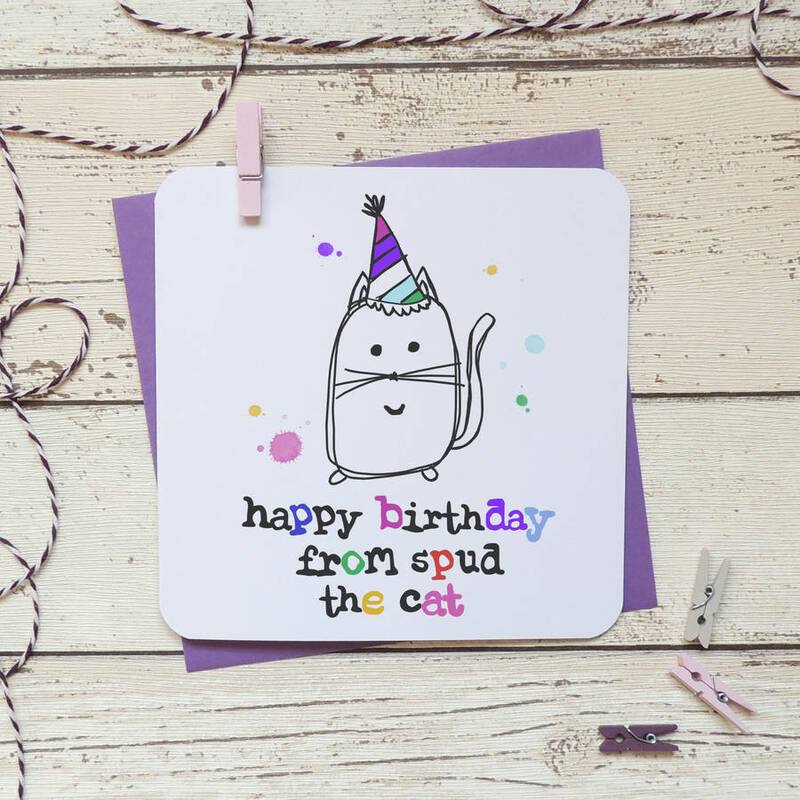 A funny personalised card to wish someone a happy birthday from the cat! 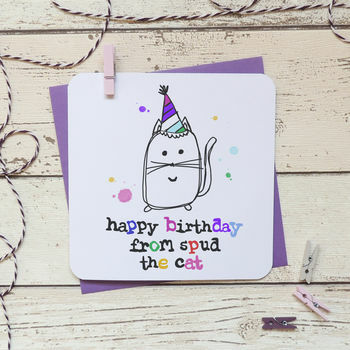 The card features the words 'happy birthday from (name) the cat' in a messy handwritten style font, created by Parsy Card Co.
A happy little cat character with a party hat on is stood above the text. please enter the name you require in the box to the right. You can choose to add a message inside the card by selecting 'yes please' from the drop down box and enter the message you require in the box below that one. If you choose to send it direct, please write your personalised message for inside the card in the box provided and we will print it exactly as written. Each card comes packaged with its own purple envelope embossed with the Parsy logo on the rear, which can easily be written on with a black pen, all dispatched in a cello bag in a card-backed envelope for extra protection in transit. If you have any queries regarding text personalisation, you can contact Parsy via the 'ask seller a question' button above. The card is made from excellent quality 350gsm white card with funky curved edges. The envelope is purple and is made from 100gsm paper. It is embossed with the Parsy logo on the rear and can easily be written on with black pen. This product is dispatched to you by Parsy Card Co.